I am not a sweets person or a salt person. I am a cream person. Sour, crème fraîche, light, heavy, I’m on board. When I lived in England, I was in heaven: cream tea, clotted cream, the milkfat that floated to the top of the bottle I received on my doorstep every morning. “This is too rich for me” is a sentence I have never, and will never, utter. So, as a major cream fan, you would think that I would have mastered the art of whipping my own cream by now. But you would be wrong. Every time, I just find it frustrating. I whip and whip until my wrist is about to fall off and the muscle in my arm that only gets used for this particular purpose (or for bowling, for some reason) starts to ache. Often, I give up and beg my young, energetic children to take over. Finally, I surrender to the immersion blender to finish the job. It’s annoying. I’m lazy, but I’m not that lazy. Why can’t I whip cream by hand? For my micro-resolution this year (a micro-resolution being a skill we spend 15 minutes finessing, such as pour-over coffee or chopping onions) I decided to conquer whipping cream once and for all. Turns out the way I was whisking was all wrong as well. Garbacz stressed that you should “Whisk in a vertical, circular motion, constantly adding air to the cream. The whisk will come out of the top of the cream as you whisk vertically—this is good! If you just mix in circles in the bowl, additional air really isn’t getting into the cream.” This America’s Test Kitchen video backs her up, proving that whisking side-to-side whips cream in four minutes, as opposed to eight minutes for just circular whisking. My wrists are saved! So, I tried whipping cream by hand again, this time putting the cream and whisk in a metal bowl in the freezer. Whoops, if you put it in there for too long, you get some unappealing frost around the edges. But the combo of the cold temperature and my new side-by-side whisking method did the trick; my cream was whipped long before I felt like giving up on the whole thing and reaching for a Redi-Whip can or a Cool-Whip tub. Besides, those artificial whipped creams just can’t compare to the elegance of the real thing. I took Garbacz’s advise to “Stop whisking before you think you should—soft peaks are ideal! 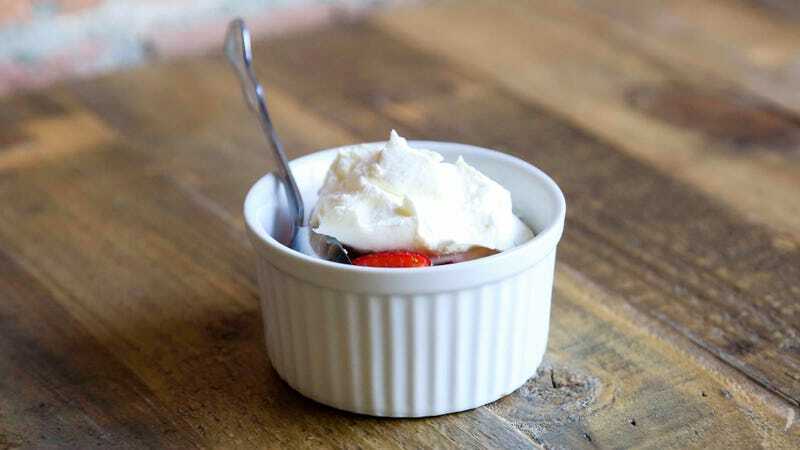 I add a small amount of powdered sugar and vanilla extract at the very end of the process.” The result made my measly store-bought January strawberries Wimbledon-worthy. I have to say I picked a pretty great micro-resolution for 2019; if the result is that I partake of more homemade whipped cream this year, all the better.